Hello, I'm the Honorable Lady Lilie of Eastham. 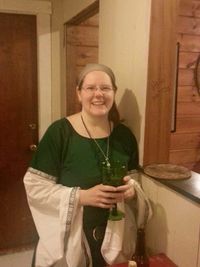 I've been involved with the SCA since I was a college freshman attending my first Birka in 1997. In case of court please notify my Pelican, Maria Pagani, and my sister Finnghualla inghen Mhic Cealleigh. If it's is known that I need to be in court, please let me know. Due to health reasons I am not always feeling up to sitting through court. Advanced warning means I can plan accordingly and make sure I am there. The reason can remain a surprise. This page was last edited on 21 March 2019, at 20:15.